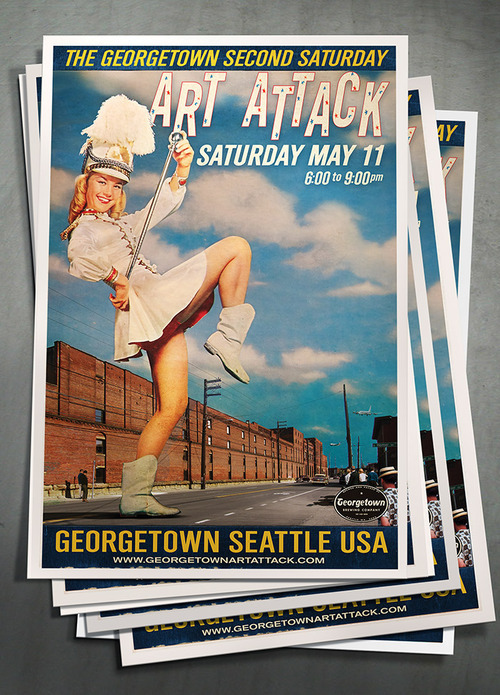 The May Art Attack postcards should be arriving next week. Featuring the happiest (and tallest!) majorette we’ve ever seen. Apparently she’s pleased as punch to be marching down Airport Way South. 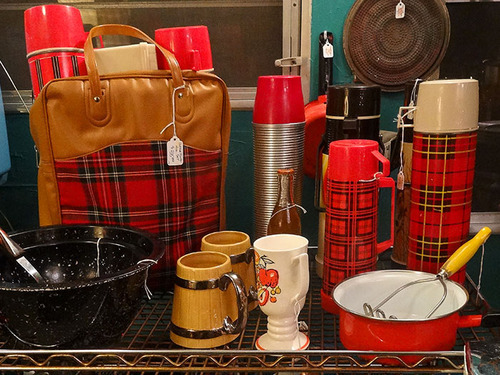 Plaid treasures at the Georgetown Trailer Park. “The Art of RK Post”, a retrospective of illustration at Krab Jab Studio. 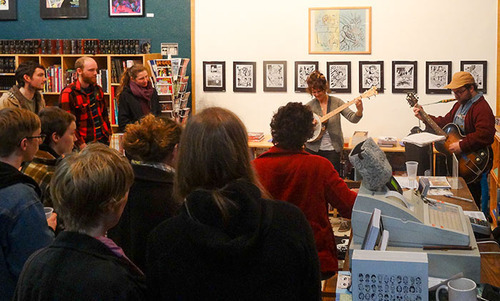 Lexi Lee entertains the crowd at the Fantagraphics bookstore and Gallery. “Pieces of a Whole” by Sean M. Johnson at LxWxH Gallery. So you’ve bitten off the ears and tails of your chocolate bunnies, you have enough eggs to make sandwiches for a year, can April get any better? 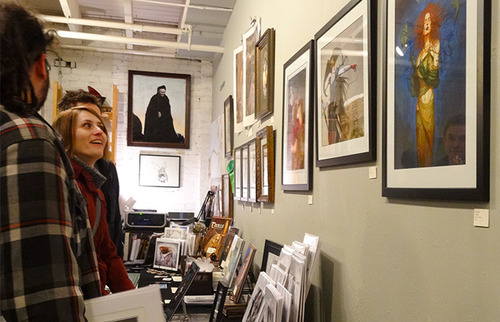 One only needs to hop down to Georgetown during our monthly art walk to find out! 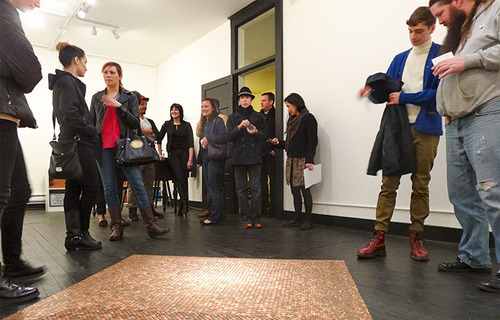 Seattle’s Only Free Art Ride Bus runs up and down Airport Way South and to The Equinox and Laurelhurst Cellars every 15 minutes, from 6 – 9:30 pm. Hop on the “Art Ride” and let us pamper you! Look for the “Art Ride” bus stops, manned by fanciful tour guides. • All City Coffee presents “Stück in Transition,” pencil and ink drawings by Yakima based artist Kristen Michael. • American Pie and Bakery hosts “Mechanical Birds, Masks and Marionettes”, watercolor paintings and illustrations by Braden Duncan. • Calamity Jane’s presents “Diverse Beauty”, a solo show of paintings by George Jennings. Syd Shera, clay art: open studio! M. Anne Sweet, graphic artist: displaying feminist themed art. Tabasco the Blacksmith: Tabasco will answer all questions. Karl Seng, lampmaker extraordinaire: open studio! Steve Hussey, of Burning Specialties (Steel): is showing his newest fabrications. Naz, Colin and Garth of the Machine Shop, Metal tooling and Industrial Make-Stuff Guys are demonstrating their CNC lathe. Dan Morgan, woodworker: will be doing a live wood turning demo on his lathe. Betty Jo Costanzo, (oil painter): is enhancing her Lake Chelan series. Trevor Gauntlett, (Steel, welding): will exhibit his metal picture frames. Sophia Wheelwright, (assemblage with a naturalist’s bent): will display a model of her stage props central to an upcoming dance performance. Michelle Smith-Lewis, (photography): will be showing her cyanotypes of forest and trees. • Fantagraphics Bookstore & Gallery present ”Dash Shaw: Stories.”, diverse works by contemporary American cartoonist and animator Dash Shaw. • The Georgetown Arts & Cultural Center hosts “Saints, Sinners and Sith”, recent Star Wars themed works by Zeuf. • Georgetown Atelier hosts its monthly free drawing jam featuring a costumed model, bring your sketchbook and join in! • The Georgetown Liquor Company will display old school tattoo flash designs by Jacob Cass and oil paintings of exotic birds by Kat Houseman. • Georgetown Trailer Park Mall welcome to the Georgetown Trailer Park Mall Intergalactic Space Travel Party! Featuring Modern Mystics, Frida, Make Believe, Beavers Den, Clocharde & Tic Tac Vintage! • Krab Jab Studio presents “The Art of RK Post”, a retrospective of illustration. • LxWxH Gallery presents “Pieces of a Whole” by Sean M. Johnson. • Mary Tudor & Ferrell features Mary Tudor art with timeless, iconic, images verging on being meditative objects and Ferrell with spacial and abstract paintings. Music by Luscious Leopard Lips, the Georgetown atmospheric music DJ with a Theremin synthesizer. • Waxing Impressions features an open studio – learn about the process of encaustic painting! Did you see the April Postcard? The giant jackalope is back! The biggest art patron known to man! If he wants to check out your gallery, be careful, those rays coming out of his eyes are deadly. 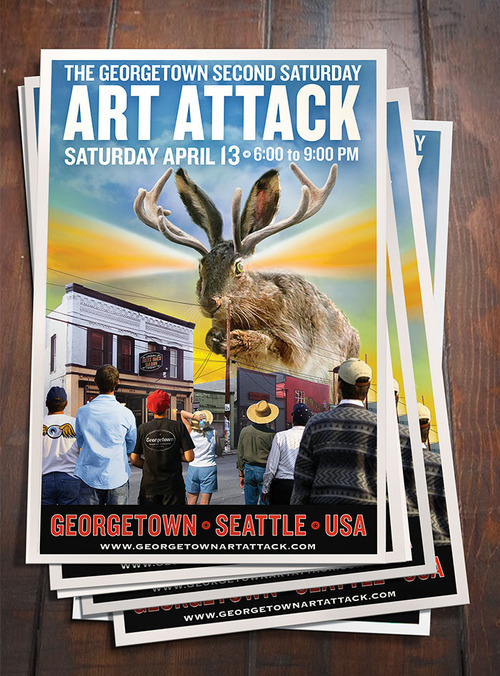 Come to the Georgetown Art Attack Satuday April 13th! All City Coffee, American Pie and Bakery, Calamity Jane’s, Equinox Studios, Fantagraphics Bookstore & Gallery, The Georgetown Arts & Cultural Center, Georgetown Atelier, The Georgetown Liquor Company, Georgetown Trailer Park Mall, Krab Jab Studio, LxWxH Gallery, Mary Tudor & Ferrell, Waxing Impressions and Much Much More!